I have no excuses, so I offer none. Today promises temperatures that are not in the triple digit range, so I think I'll do some cooking for a change. Maybe a meatloaf or something. With real vegetables. The problem now is what to write next. 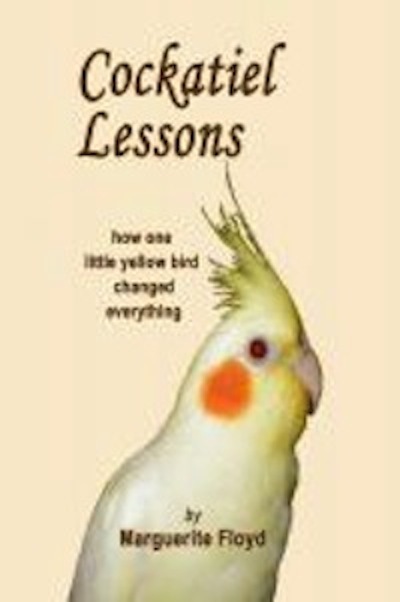 I've been thinking about doing a book on how parrots change lives, but there are a lot of logistics to work out first. The parrots in my life are, as usual, perfect. The Bobbsey Twins like to stand on the open door of their cage and just watch things. Or nap. At least once a day one of them will become frightened of something real or imaginary, fly off and across the room, and land on top of the kitchen cabinets. This causes the other one to follow suit. Then come the contact and alarm calls (though they're standing next to one another) for me to come "rescue" them. Which I do and they fly back to their cage and stand on the open door. Charli has developed some sort of obsession with her metal food bowl. I've used these bowls for years as well as small white bowls, but suddenly the metal bowl must be attacked, thrown around, and subdued. I've been trying to get it on video because it's so adorable how Charli hauls that bowl around, but once she sees the camera she drops the bowl and pretends everything is normal. Right, like anything is normal in this household . . . .